When I went to school, subjects were compartmentalised. Kings and queens were history, and mountains and valleys were geography. Finding out where the Vikings landed was history, not geography, whereas Isaac Newton was studied in physics, not as a historical father of the Enlightenment. So when I first encountered Christopher Lloyd’s What on Earth? Timelines I was intrigued by the mix of learning – laid out in a timeline so that you could track that in 1905 Einstein’s Theory of Relativity was published in the same year that Koch received the Nobel Prize for identifying bacteria as disease-carrying agents, just four years after Marconi first broadcast radio across the Atlantic. When you look at things like this, you can start to link events across a spectrum of subjects that make interesting comparisons and links. It inspired me to discover that this was the year that the Russian Tsar Nicholas II granted Russia’s first constitution, but Huckleberry Finn was banned from the Brooklyn Library for setting a ‘bad example’. Then I heard that Christopher Lloyd was making a Magna Carta themed timeline, drawing a web through history from a single document transcribed 800 years ago this year, extrapolating a litany of freedoms and rights that involve nature and luck as much as heroes and heroines in history. Without the rats bringing the Black Death, would feudalism have ended? Without John Locke’s Two Treatises of Government, would Thomas Jefferson have drafted The Rights of Man? The timeline is starkly visual, with line drawings of famous figures and objects in history, colour coded to denote geography, and dated along the bottom line so that parallels can be drawn across continents. The Magna Carta Chronicle has a guide to the Salisbury Cathedral document itself on the back – as well as, like the other What on Earth Timelines – newspaper articles telling the stories of famous moments in history. This is a great textual way of bringing history to life, and stems from Christopher’s past career as a journalist. 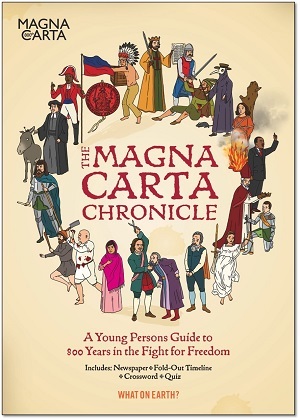 The Magna Carta timeline has been donated to 21,000 primary schools, funded by charitable donations to the Magna Carta 800th Anniversary Committee, which is a worthwhile enterprise. The other What On Earth? 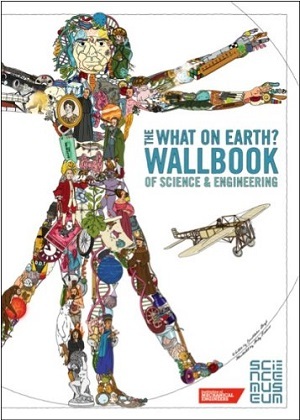 Timelines, including Natural History, Science and Engineering, and Shakespeare, to name a few, are also available – I personally like the Science and Engineering best. When showing them to schools, myself and other librarians have been struck by how dynamic and accessible they are for children – but if for school rather than home use, would probably warrant the more expensive laminated copies – otherwise the stretchy timelines could be torn by over enthusiastic readers. In a time when I’ve decried the lack of decent non-fiction available for children, it’s good to have someone looking at how children absorb facts, and trying to use creativity to invent new ways of presenting pertinent information, drawing links between things that help our understanding and pique our curiosity. You can purchase from Amazon on the side bar or by clicking here for the Science and Engineering Timeline, or here for the Magna Carta Timeline.